Begin by taking your skirt centre front piece, and your two skirt side front pieces. Lay them out as shown in the image below, wrong sides facing you. Pinch the seams together either side of the skirt centre front and pin into place. Stitch the seams, clip the curves and press open. 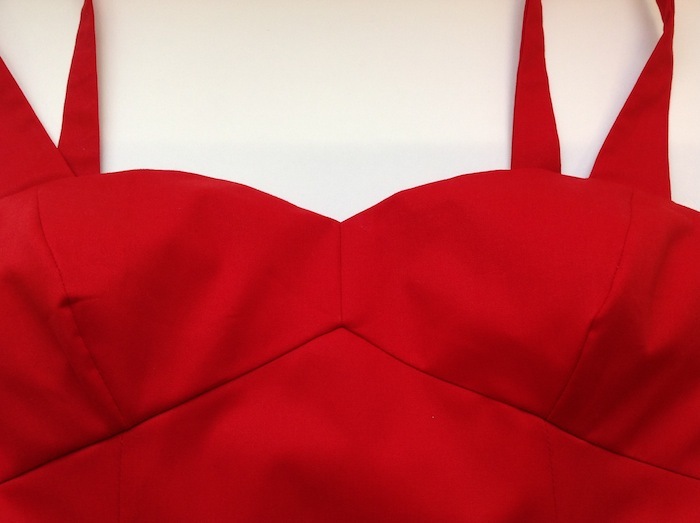 Use your tailors ham here to help you to press the curves at the waist and hips, just as you did with the bodice cups. Finish the excess seam allowance either by overlocking/serging or pinking. 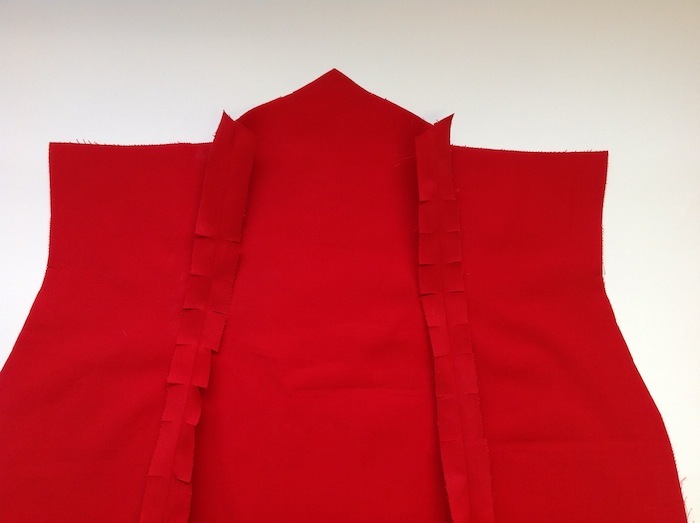 Repeat the last three steps for the skirt centre back and skirt side back pieces. 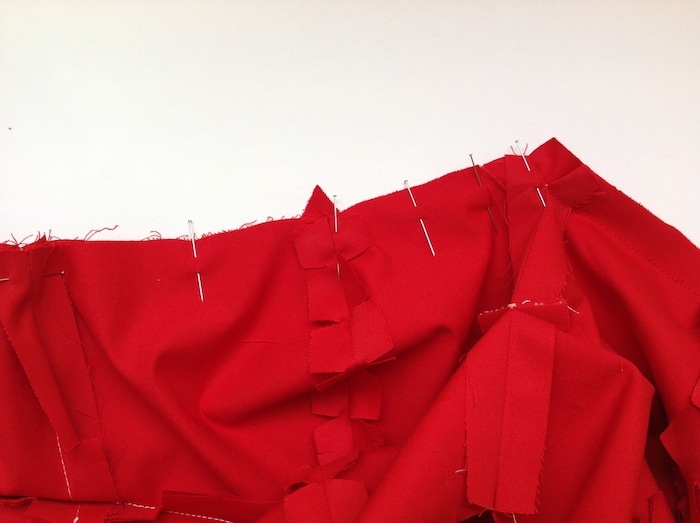 Now place your skirt back onto your skirt front, right sides together, and close the side seam that will be the righthand side of your body - we need to leave the lefthand side seam open for now as this is where we'll be inserting our zippers. Clip curves, press open and finish. 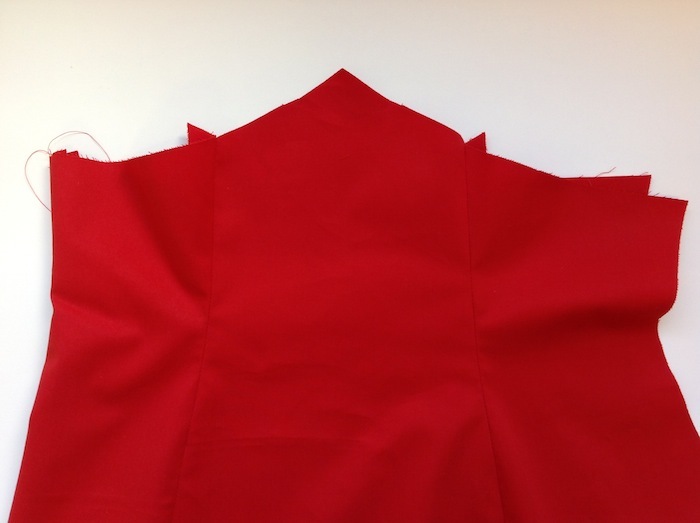 If you are fully lining your Georgia Dress, repeat these steps to assemble your skirt lining panels, remembering to close the opposite side seam to the one you closed for the shell. This is probably the trickiest part of the whole construction of the Georgia Dress. Pulling off the V-shaped seam at centre front and centre back is fiddly and involves a fair bit of fabric manipulation and a lot bit of concentration! Lay out your skirt open and right side facing you. 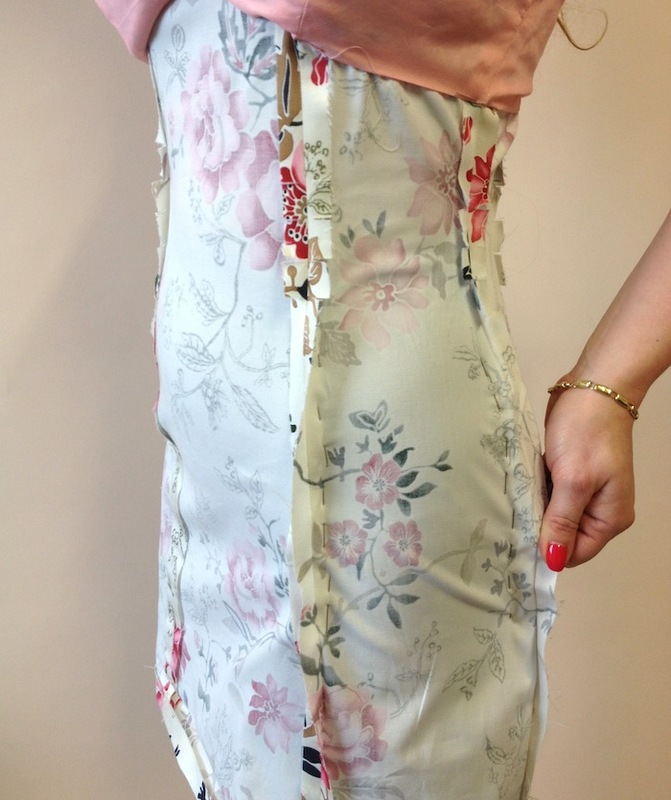 Place the bodice, upside down and lining facing you, onto the skirt, lining up the waistlines. 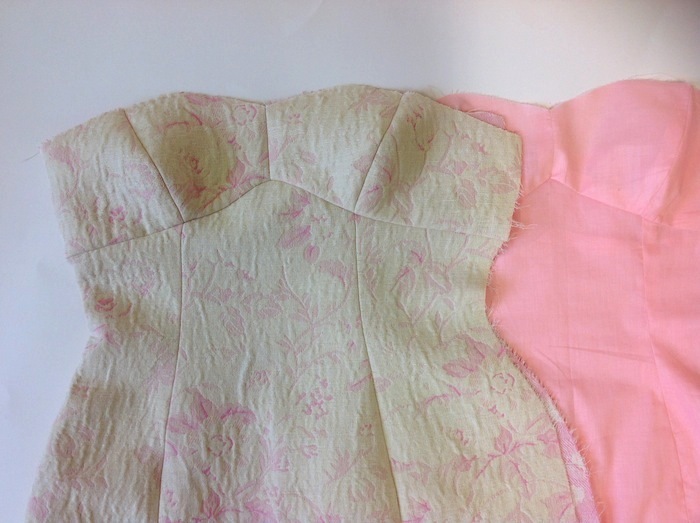 We are going to start by joining the skirt to the bodice from the centre front and out to the open side seam (where the zipper will be inserted). Keeping the bodice lining out of the way, open out the bodice shell centre front - the part where we left 5/8" unstitched - and making sure that that centre front seam is directly in line with the peak of the V on the skirt centre front, begin pinning the bodice shell to the skirt from the centre front out to the open side seam, using the images below as a guide. Be sure to match notches and panel seams. Starting at the centre front, and using the image below as a guide, stitch into place. 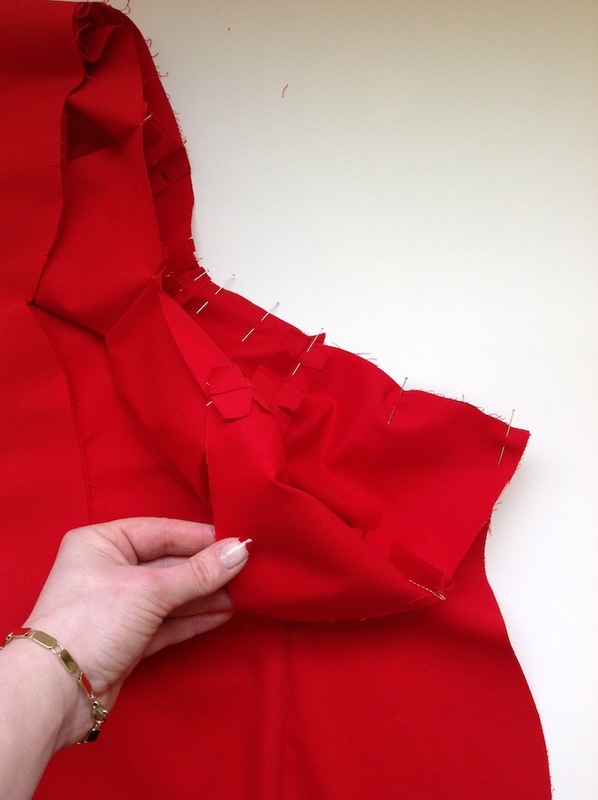 You should now be able to see how, by pivoting your bodice from the centre front, you can pin the rest of the bodice to the skirt at the waistline. Take care to match seams and notches as you go. When you get to the less extreme peak at the centre back, simply snip into the excess seam allowance of the bodice at the centre back point to enable you to open it out and pivot in the same way as for the centre front. 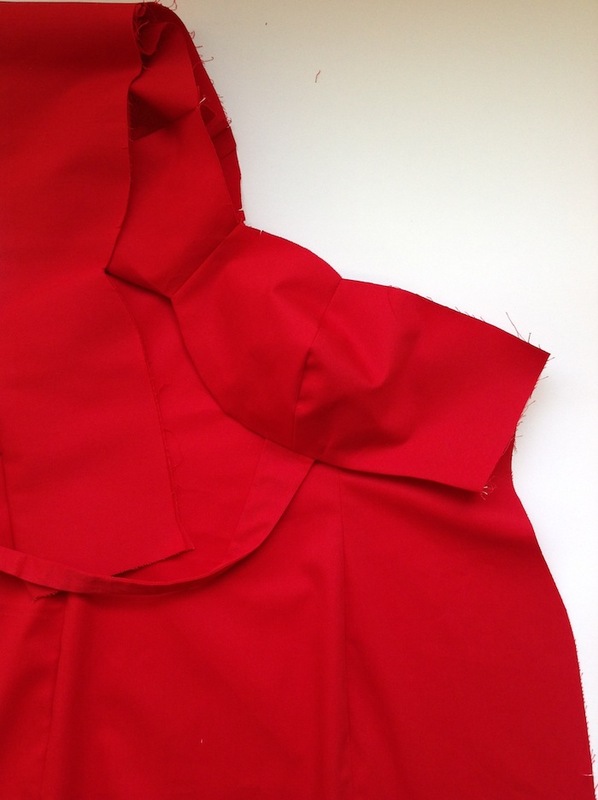 Stitch the remainder of the waistline into place, clip the curves and press the excess seam allowance up into the bodice. 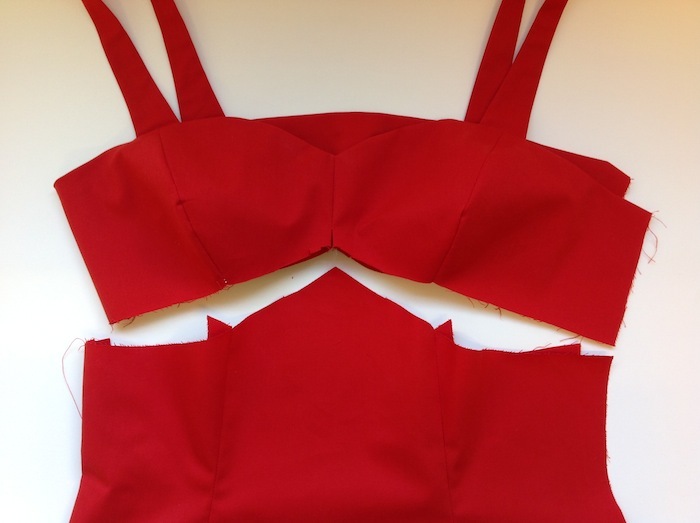 ...And if you're going for our bonus strapless variation, you should have your bodice and skirt shell now joined, but the lining still separate - we'll be joining the lining to the shell once we're done with the boning...! TIP: Now would be an excellent moment to try on your dress to check the fit of the skirt. 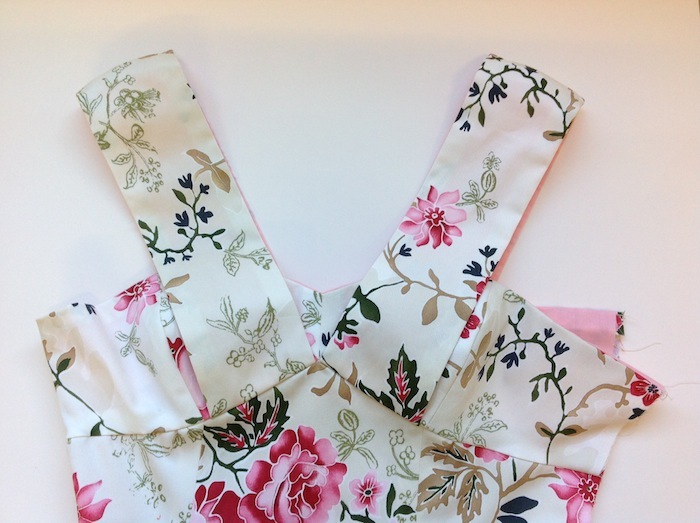 Put on your dress inside out and pin the open side seam, mimicking the closed zipper. 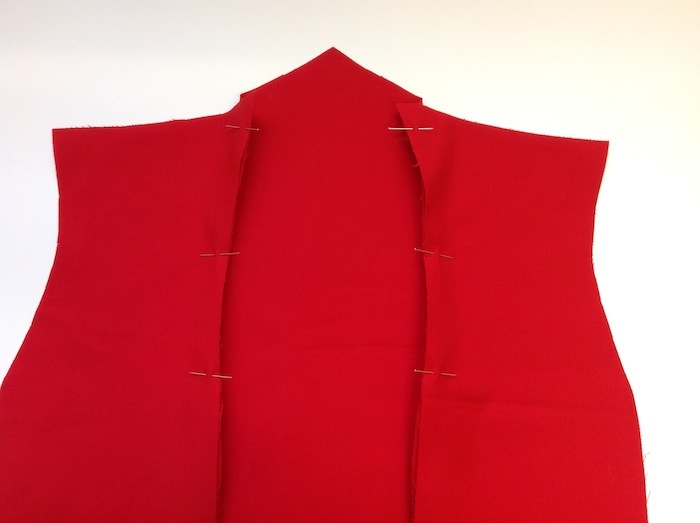 If you feel it could use some tweaking here and there to better hug your figure, grab some pins and start pinching out excess at the seams evenly throughout all panels. If you can get someone to help you out here, pinching and pinning while you stand up straight, you'll get the best results. 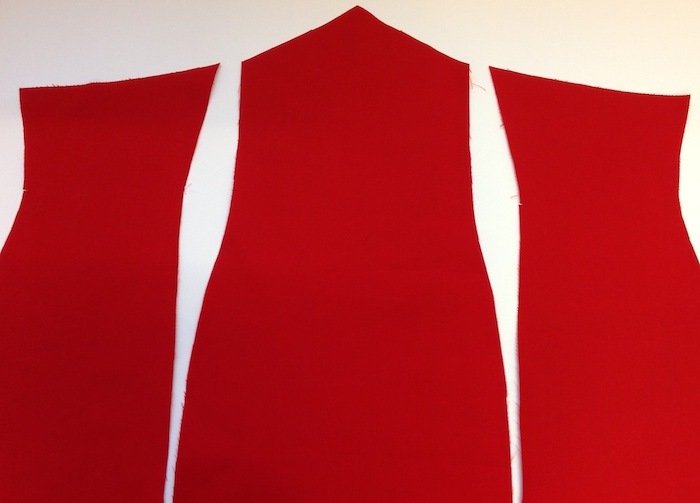 Once you're happy with the fit, unpin the side seam and stitch your alterations into place. Try your dress on again before your go ahead and trim/finish the excess seam allowances! *Variation 1 and Variation 2 gals - you're done for the week! Crack out the wine, put your feet up and catch up with the latest episode of New Girl. We'll see you next week for the final post in this sewalong where we'll be inserting zippers, hemming and putting the finishing touches to our Georgia's. For now, over and out homies. 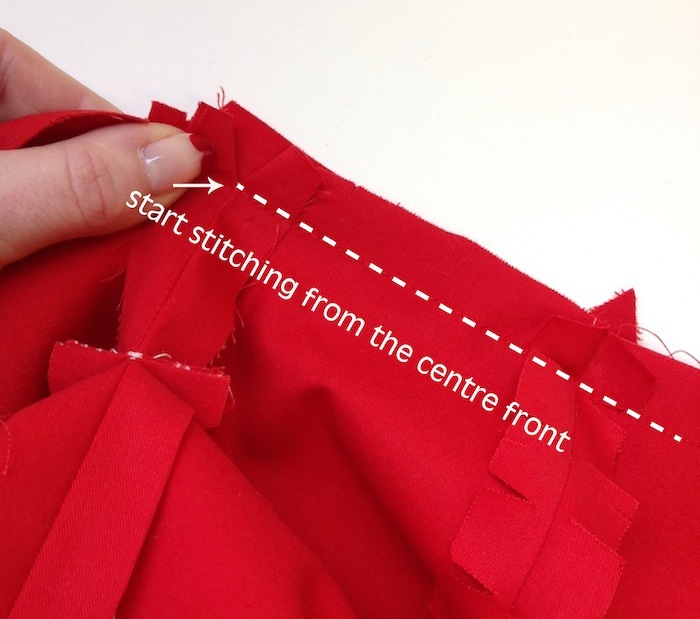 Do you backstitch as you sew out from the centre front? Just LOVING this pattern!! I am up to my 3rd Georgia. The tutorials are so helpful! Whipped most of mine up last night in about 2.5 hrs!! Even the tricky V shaped seam only took one shot!! 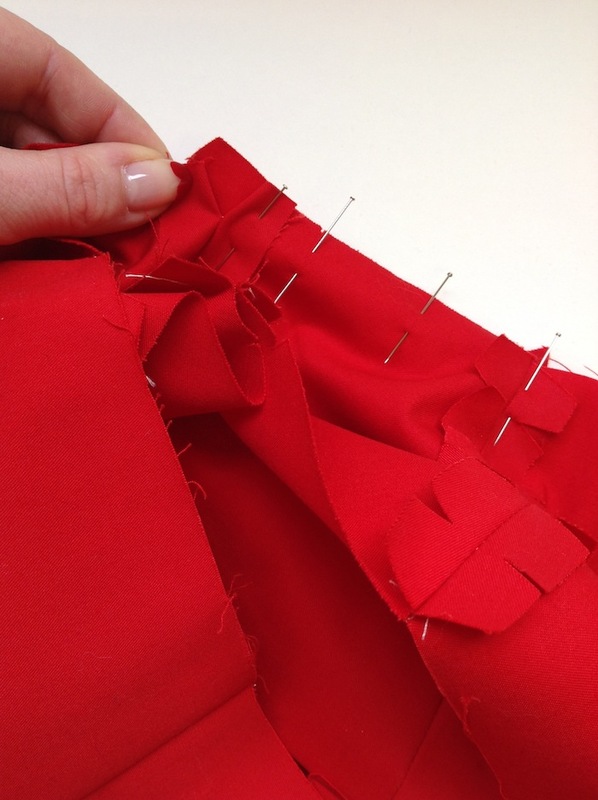 Love the tip on how to pin the skirt pieces together, so helpful!! !